Simplify a major exterior paint project without taking any shortcuts that could affect the quality of the finished job. All it takes is a smarter set of tools. Painting the exterior of your house is a big project that can quickly turn into a huge headache if you’re not adequately prepared. Just picture yourself atop a ladder, brushing on coats of paint in the sweltering heat as wasps circle your head. While the image may seem cartoonish, some variation of it is an all-too-common tale—but it doesn’t have to be. The right materials, tools, and techniques can help you minimize disaster and maximize your time. 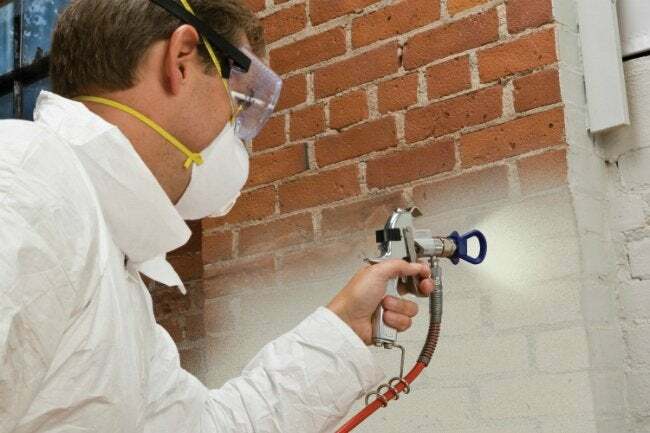 The key to it all is a new technology that’s taking the painting world by storm: Hyde Tools’ Airless Spray System with Rapid Valve Transfer® (RVT) Technology. The RVT system takes airless paint spraying to a new level—both literally and figuratively—by allowing the user to paint areas that are higher up just as easily as lower ones via a quick-switch valve that attaches to both a spray gun and a special telescoping pole. Homeowners and professional painters alike can now paint the entire exterior of a home while keeping their feet firmly on the ground, eliminating the need to erect scaffolding or the danger of climbing up and down a ladder. While the following tried-and-true painting techniques will also work if you want to brush on or roll on exterior paint, you’ll save time and reduce the risk of falls when you use Hyde Tools’ new RVT system, which works with any standard airless spray pump rated up to 3600 PSI. Check the weather forecast before you start painting. The best temperature for painting the exterior of your house is between 50 and 85 degrees Fahrenheit; in temperatures higher than that, the moisture in the paint can evaporate too quickly and weaken its bond to the siding. Choose a calm day when no rain or wind is expected. The siding should be bone-dry when you paint, and the last thing you want is for high winds to blow dust onto your new paint job. • Exterior paint that contains 100 percent acrylic resins will hold up best to the elements. • A low-sheen or flat paint works well on the siding itself, while a satin or semi-gloss paint is best saved for doors and trim. While priming before painting is a good rule of thumb in almost any situation, it’s not imperative. If, however, you’re painting the first coat on bare siding, primer is a must; it adheres tightly to the siding and provides an optimal surface for the paint to cling to. (Make sure to check the label carefully to pick a primer that’s suitable for use with both your type of siding and the paint you are applying.) If you’re just repainting, though, you can skip the stand-alone coat of primer. Note that some newer products offer a combination of paint and primer in a single product, which can be a real time-saver for both do-it-yourselfers and pro painters. Most types of siding can be painted, although some require additional preparation or a specific type of paint. To make sure you’re on track with your plans for your exterior paint project, check out these basic tips for different types of siding. • Wood Siding: This common material is easy to paint, so long as it’s completely clean, dry, and free from flaking paint. 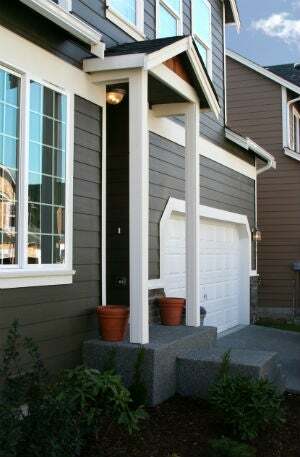 • Masonite Siding: Masonite is also easy to paint, but be sure to caulk gaps between siding planks carefully to keep water from penetrating beneath the painted surface. • Vinyl Siding: Choose paint manufactured specifically for vinyl siding. Appropriate paints contain a high percentage of acrylic, which adheres well to vinyl. • T1-11 Siding: Pronounced “tee-one-eleven,” this type of wood or wood-based siding does not hold paint well. Its surface tends to flake off, taking off bits of paint with it. A better choice for T1-11 is to spray it with a penetrating acrylic-based stain—but don’t worry, this can be accomplished just as easily with the Airless Spray System with RVT Technology. It’s rated up to 3600 PSI and works with a variety of paints and coatings. • Masonry or Stucco: Both can be painted successfully if you remove mold or mildew stains prior to the job. If the siding has been painted previously, you can use virtually any high-quality exterior paint, but bare masonry or stucco needs a coat of exterior masonry primer, which will protect the paint from the strong alkali content in the masonry. • Steel Siding: Choose an exterior paint specifically designed for steel siding. Before you go to town, though, clear all rust or corrosion spots and seal those areas with a rust-remediation product to ensure that they do not bleed through the new paint. • Scrape away any loose paint using a 5-in-1 Painter’s Tool, and sand down rough patches, if necessary. • Caulk gaps around windows and doors with paintable exterior caulking. • Remove all traces of mold and mildew using a cleanser that contains mildewcide. • Replace or repair loose, broken, or rotted siding planks, as paint will not adhere to these damaged surfaces. • Remove shutters before painting, and if you’re going to spray the paint on—as we recommend—cover windows, doors, and any nearby objects with plastic sheeting to prevent overspray from affecting these features. When updating the color of your home’s exterior, you’ll use the same techniques for both priming (if necessary) and painting, so the following guidelines apply to both processes. If this is the first time you’ve operated an airless spray gun, practice on a sheet of plywood before aiming it at the house! Concentrate on smooth, even strokes while holding the tip of the spray gun approximately 12 inches from the surface. Ready to try it out on the house? Tape up trim and cover windows—and any other feature you cannot unscrew—with a plastic tarp before you get started. To paint the lower portion of the house, attach the RVT valve to the spray gun that comes with the Hyde Tools’ Airless Spray System. (Also included in the system are a spray tip, a tip guard, an inline filter, and a pole that telescopes from five to eight feet in length.) As you paint, guide the spray gun in careful strokes, just as you did while practicing, and keep its tip approximately one foot away from the siding; this distance is close enough for the primer or paint to lightly coat the siding, but not so close that drips develop. The trick to accurate paint spraying is to keep the gun an even distance from the surface at all times. If your strokes arc and flare out at the start or stop of your strokes, you won’t get uniform coverage. To keep from leaving start and stop marks, which can show through later even after multiple coats of paint, the movement of your stroke should begin before you squeeze the paint gun trigger and should continue after you release it. Coat the entire lower half of the exterior, working back and forth uniformly. Then, when it’s time to start painting above chest level, there’s no need to drop everything to assemble scaffolding or haul out a ladder. Here’s where the unique telescoping pole comes into play. In just seconds, you can remove the live RVT valve from the handheld spray gun and snap it into place on top of the telescoping pole. Because you don’t have to fuss with depressurizing the gun or changing hoses—and you’re not climbing up and down scaffolding or a ladder—this quick and simple switch won’t slow down the job one bit. With the RVT valve locked in place, extend the lightweight pole and continue spraying the upper part of the siding by squeezing the trigger, conveniently located at the base of the pole. And, since you’re using the same valve, you won’t spot any difference in your paint spray pattern from top to bottom. You’ll get all the convenience of a shortcut without any of the consequences! Continue working up and down the side of the house, focusing on keeping your transitions seamless. For the best coverage, spray on multiple (three or more) light coats of paint, always waiting until the previous coat has dried completely. Check the paint can for recommended dry times. After you’ve completely refreshed the siding, you won’t want the old, failing paint jobs on the trim, doors, and decorative molding to detract from your smart new facade. To tackle these areas, you’ll need to apply paint by hand with a roller or brush. Fortunately, you’ve saved so much time using the RVT airless spray system that you can afford to lavish attention on these last details, giving them a flawless finish.